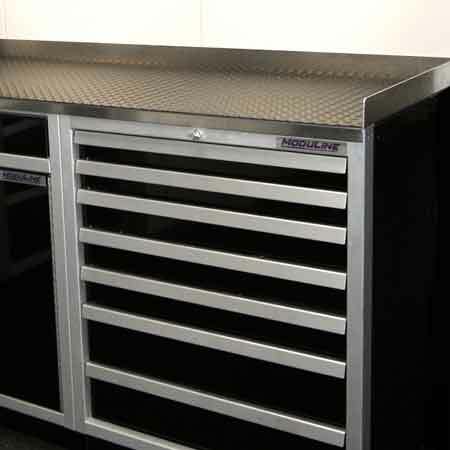 Easily turn a 90 degree corner between Base Cabinets and/or Built-in Tool Boxes. Countertop is #4 polished stainless steel. Brace and filler are military-grade aluminum. Includes the Countertop, and all necessary bracing and color matched fillers. Color matched to go with your base cabinets or Built-in Tool Boxes. Filler color available in Moduline Blue, Red or Signature Black, high-gloss finish.